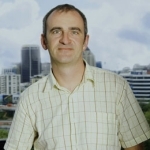 Adland has an interesting interview with Draft New Zealand Creative Director Chris Hunter. Adland queries Hunter about the seeming proliferation of ambient advertising in the country, the Kiwi mentality, the power of the idea in relation to the media used to convey that idea and how much she loves "men with legs like muscle-trees run around in teeny shorts and slam into each other in big sweating piles." Give it a read. Brooklyn agency The Brooklyn Brothers has created The Inferiator which, by asking you to answer a few questions, can tell you inferior your agency is to theirs. We're guessing every outcome is going to name your agency inferior. It's simple enough to check out. Alex Bogusky talks to Business Week's David Kiley about his agency's work on Volkswagen, Miller Light and Burger King. Kiley's asked Bogusky about the recent VW crash ads and the controversy it created. Bogusky says he just ignoires the critics, doen't think about them during the creative process and thinks only about what will help the client move product. Oh, an he seems to have a new haircut. Check it all out here. We're not sure about "having a relationship with" a rabbit though. Here's something we all want to see. It captures every stereotype that defines that pompous, hipster dickhead next to you that calls himself a creative. 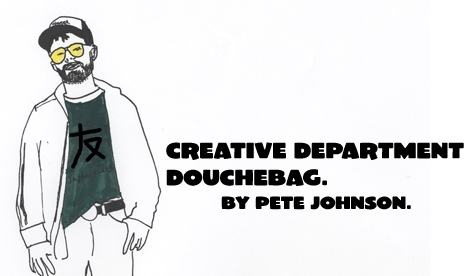 Wallow in the hilarity of the Creative Department Douchebag by Pete Johnson. Perhaps you've seen the Tango Clear spoof of the Sony Bravia ad which had colored balls roll down the hills of San Francisco. 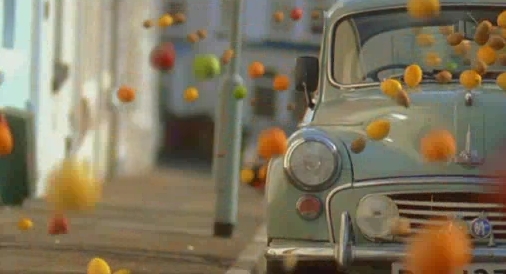 The Tango Clear ad does it with fruit and lots of it. Apparently, the ad, shot in Wales, has some residents in Swansea so upset, they've launched a cheesy looking website to protest against the damage all that fruit did in Wales and to state it will never happen in Swansea. Actually, a little Whois research points out the creators of the Tango Clear ad, Clemmow Hornby Inge, created the protest site apparently hoping to keep the fruit rolling a bit longer. Another agency throw down is about to take place. Euro RSCG 4D is suing is former CEO Charles Tarzian and has filed suit in the New York Supreme Court. Euro RSCG 4D claims Tarzian tries to steal clients, used confidential information to do so and recruited the agency's employees after he had left. Apparenlty, he also lied to 4D clients to seemingly place a bad taste in their mouths which might give them cause to leave 4D and to go with Tarzian. Someday, we'll all learch to get along and be honest.